Making a matrix with 9 inputs isn’t all that bad. I wouldn’t mind wiring each one up. But when we get two orders of magnitude bigger to 900, we want something more cleverly constructed, reducing duplicity and manual labor. While Googling one day I looked down to see my hands dancing across hardware with almost 100 inputs and realized: how are keyboards made, and can it help us? FC Keyboard Key Schematic. Credit AtariUSA, Inc.
I’m not going to delve into the inner workings of the computer and its keyboard, its hardware interrupts, etc. what is important is that this matrix design, by using intersections, tremendously reduces our hardware requirements. 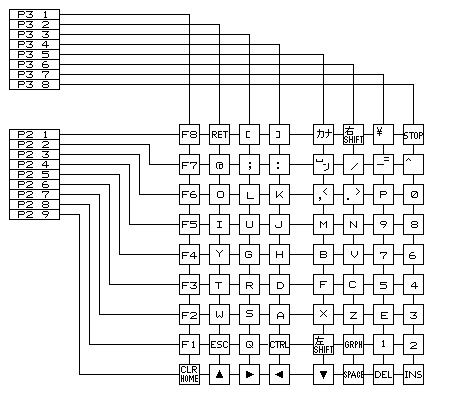 Looking at the animated diagram, notice the ‘microcontroller’ block – this is exactly what an Arduino is! Let’s say we implemented an Arduino touch pad with this structure, minus ‘S0.’ We would need 3 pins for the columns and 3 pins for the rows, 6 Arduino pins total for 9 unique inputs. Pretty good deal. However, what if we needed 900 unique inputs? Having 30 rows and 30 columns requires 60 pins. This is much better than, say, 1800 – 2700 pins required (without multiplexers) for 900 single buttons. Keyboards are hard (normally). Quilts are soft (normally). We are not trying to fit or not fit into any norms here, but the mechanical keyboards beloved by serious typists: not our target. 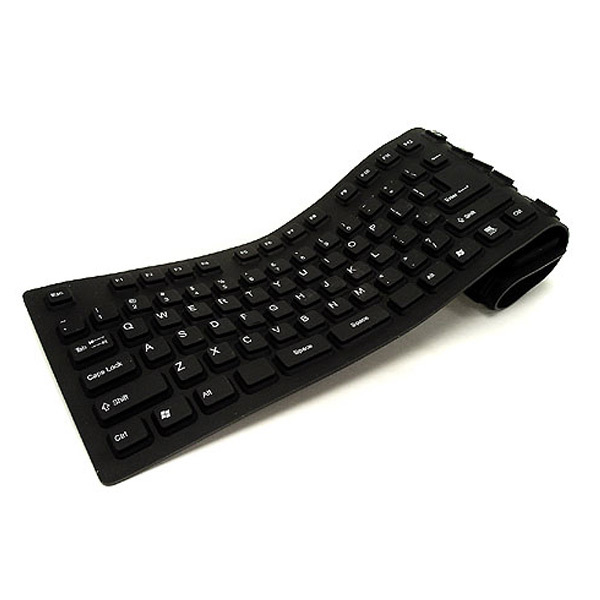 On the other hand, flexible membrane keyboards can be useful models. Our quilt doesn’t need to have flexibility akin to yoga mats (or instructors), but studying the membrane switches in these keyboards can inspire a quilt-appropriate control schema. I’ve always been a fan of How It’s Made. I watch it for fun when it comes on the Science Channel. Of course, after learning about keyboard membrane controllers, I turned to see if my perennial source of manufacturing enlightenment has covered their creation. And of course, it has. Chronicled below is the making of a control board for an oven from ‘How It’s Made: Membrane Switches.’ You are probably using membrane switches on your oven or washing machine at home right now. However, the oven control board and membrane keyboard’s internal components are very similar – the membrane keyboard simply has dome switches in addition to the membrane to provide gratifying & necessary tactile feedback. Below, we see that silver conductive ink is screen printed onto plastic membranes. Here, we can view conductive traces up close. Lastly, we see an adhesive separator applied to the circuit. Why is this applied? This can be explained with yet another helpful diagram. The separator can be thought of as the ‘holes’ layer in black. This layer separates two layers of conductive traces. The conductive traces on the bottom are carrying a current. When someone presses the top, they press another conductive trace that bridges the gap between the traces on the bottom layer. This switch is now ‘closed’, instantly detected by the device. Each possible combination has unique pro’s and con’s, but the most important next step is to venture into the wild and begin rapid prototyping a 3×3 matrix control pad with the Arduino Mega (similar to the animated circuit diagram up top, minus ‘S0’). The results will show whether this concept can handle 900 unique inputs just as well as single buttons and capacitive touch, only much more efficiently.